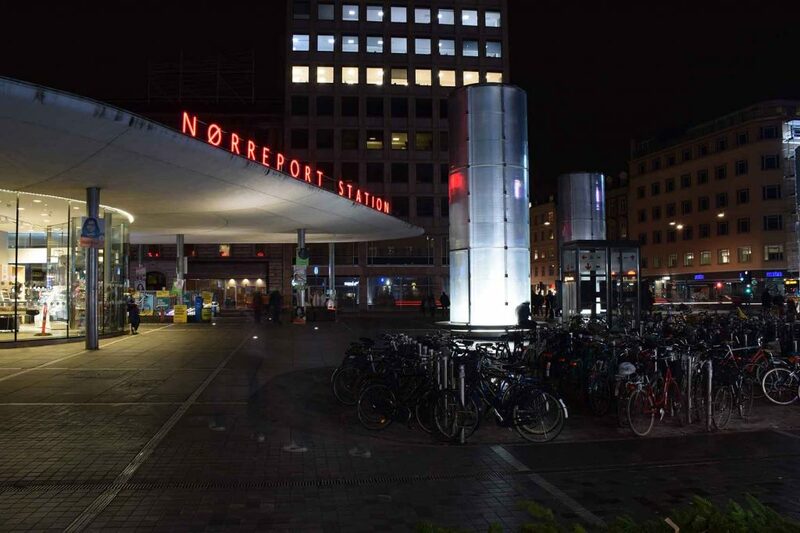 The square at Nørreport station is one of Copenhagen’s busiest. The lighting gives the space identity in the dark hours. The rounded roofs are softly illuminated from the underside with warm white light, which brings the attention of the offers that travelers find under the roofs: ticket sales, kiosks, toilets and perron stairs. The high light columns that are involved in perron ventilation are illuminated from below and tinted toward the top. On round benches at the column foot you can rest with the light in the back and have a good view of the square. The lights in the columns are cold and slightly flickering, so they stand like moon rays connecting the square with the sky above the city. The bikes are placed in recessed bicycle beds. Each bicycle rack is equipped with a solar powered luminous gem on top. In the dark, a blanket spreads over the parked bikes, which almost become an attraction after sunset. Variation and visual attractions make the site vibrant and rich in identity while at the same time keeping an overview and security. The project was awarded with The Danish Lighting Award 2016. Catch a bus, train or metro from here.